You may have already forgotten I purchased this dress, yes? I purchased it at the same time I purchased this ricrac number during the big ShopBop sale in March, and waited forever to wear it! Luckily, a trip to Mayakoba came up and I finally had the opportunity! I’m glad I waited though, because it is now ON SALE! Isn’t it dreamy?! I love the ethereal look of the flowy white lace and the flattering, fitted one-shoulder bodice. It’s such a pretty summer staple for date night, but can be paired with flat sandals for daytime wear too. Did I mention it’s also available in black and this cute blue stripe? Another item I picked up right before my Riviera Maya getaway is this pair of beaded blossom earrings. I’m OBSESSED! I love a good old statement earring, but I adore how these offer a more unique look than a chunky or colorful drop earring would. They are definitely on the more expensive side, but to me they are totally worth the splurge. Since these clip-ons are white, they are probably the most versatile earrings I have aside from my diamond studs! They look great with everything. I just love them! They also come in red, blue and mint. This Figue and Vitakin-inspired dress is now on sale for under $100! This broderie anglaise dress would be such an effortless coverup, don’t you think? So chic. Dramatic pleating takes this wardrobe basic to a statement staple level, and for only $55? A steal. There are only a couple sizes left, but this Michael Kors shirtdress is a feminine classic! My mom has thoroughly enjoyed this white ruffle tee, so much so, she bought it in another color! I also love the lace details and sophisticated neckline on this shirtdress. This cotton midi skirt would work as a coverup or just a casual piece to wear with tees and tanks on the weekend! This Isa Arfen silhouette is fresh and interesting, don’t you think? What a pretty white dress! 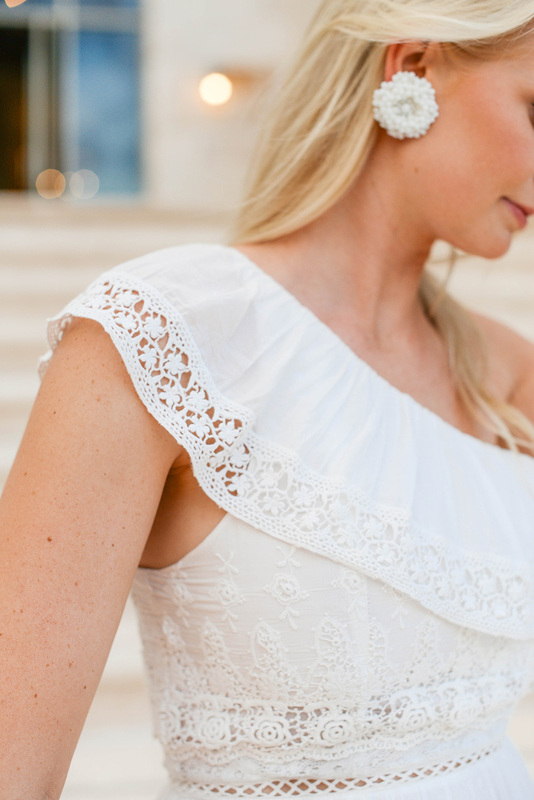 Love the one-shoulder and embroidered detailing! That dress is beautiful! I love the one shoulder and the asymmetrical hemline. So chic! So classic and chic! Loved this one on you!